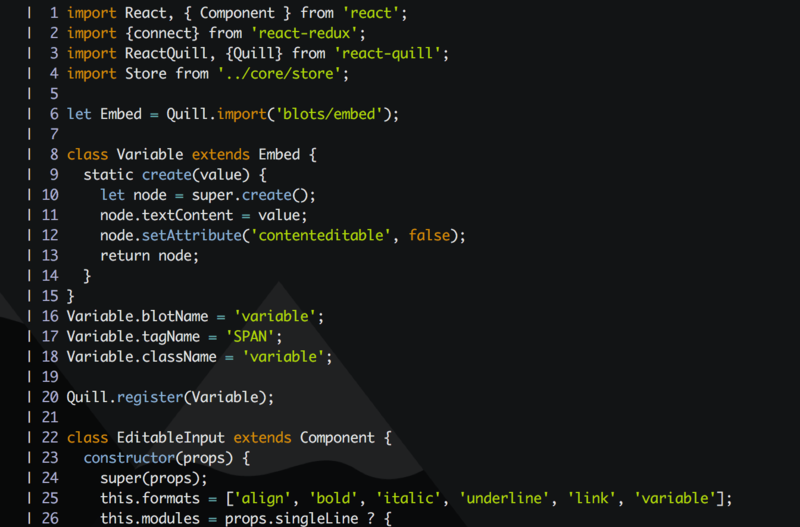 Last year, I made the switch from Sublime to Vim as my text editor. Between matching the tools I had in Sublime, and learning the keyboard, navigation, the learning curve was steep; However, I’m moving faster now than I ever have. Below are some general setup tools I used to get going, as well as keyboard shortcuts I have used the most. Disclaimer: I’m still a Vim noob; I’d love any suggestions! My Vim configuration in action. As a longtime Sublime user, I had grown accustomed to some of the amazing tools it provided, such as the file tree, linting, advanced searches, and snippets with tools like Emmet. I needed to at least match these if Vim was to be a viable option for me. After some research, I found YADR, a vim-centric dotfile repo. It proved to be an amazing starting point for me, giving me much of the above, and further configuration for the command line. I highly recommend trying it out, even if you only use vi on a limited basis. The updates to the Vim keymaps, theme, searching, git integration are just a few. You can find a rundown here. I forked the repo and made my own tweaks, based on tools I liked. The added bonus is that this gives me a good starting point on any new machine. Vim’s config lives in the ~/.vimrc file. YADR symlinks their own config file from the root of the repo. If you make a change, it’s a good idea to commit it to your YADR repo so you’ll have it for later. Two keys you use often in Vim are Escape and Control. To make things a bit easier on my hands, I remapped them. By no means is this an exhaustive list, but I find these to be the commands I’ve used the most in my first year as a Vim user. There are more than four modes in Vim, but these are the ones I used mostly. These let you split the vim pane into smaller panes, like in the screenshot above. Mark lines in the code for quick navigation later. Edit multiple lines at once. This sets inline to paste mode, which lets you pasted in code with cleaner indents. I hope this helps anyone out there who wants to start with Vim. It looks daunting, but the payoff is a big one. I am more productive now than ever. Let me know in the comments any thoughts!